An introduction to the various types of utensils, pans, & equipment used in a professional kitchen....why the different sizes and what each is best used for. This section will familiarize you with some of the numerous hand tools of the trade, and give advice on how to use them. Misuse of a tool or a piece of equipment is an "almost guaranteed" accident. Boning knife - A knife with a blade approximately six inches long, thinner and shorter than the chef's knife used to separate raw meat from bones. Bread knife - Usually 8-9 inches long with a serrated edge. 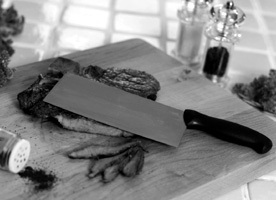 Cleaver - A knife with a rectangular blade heavy enough to cut through bone, used for chopping. Filleting Knife - A Knife with a flexible blade used for filleting fish. It's size is typically twice as long as a boning knife. Palette knife - A long-handled wide knife with a rounded blade and blunt sides, made from metal or plastic or a combination of the two. It is used to remove portions of food from baking trays, turning food that is being cooked in a pan or spreading icing or whipped cream evenly over a cake. Paring knife - A short knife with a 2-4 inch blade used for paring and trimming vegetables and fruits. 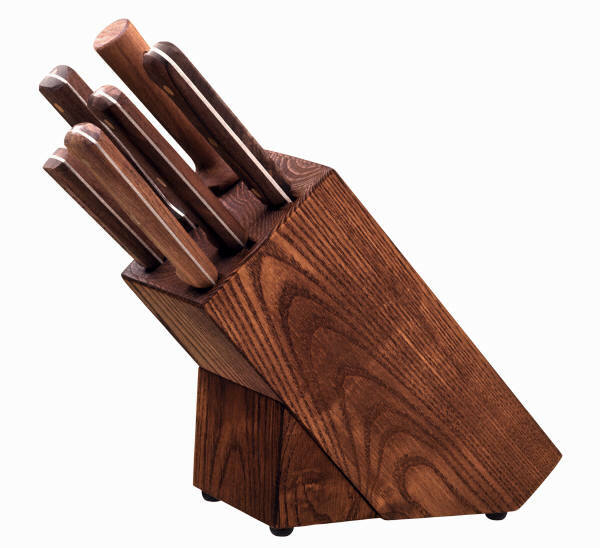 Slicer - This knife has a long blade with a round or pointed tip, which can be flexible or rigid. It may be taper-ground or have a fluted edge. It is used for slicing cooked meat. Some cooks make a distinction between a heavier, thicker carving knife (for cutting through joints) and a lighter, thinner slicing knife. Tourne knife - A knife with a curved blade, the size of a paring knife. Utility knife - A chef's knife that is 5 to 6-1/2 inches long, and sometimes has a serrated edge it can grip tomatoes and soft-skinned fruits. The serrations make them less useful for making clean cuts. vegetable peeler: cleaning carrots, potatoes, celery, etc. Use only plastic or hard finished wood, using unfinished plywood is dangerous because the bacteria cannot be removed by washing and there is the danger of wood splinters entering the food because the wood is so soft. Make sure the board is clean, and be careful what combinations of items you cut on it e.g., onions and then fruit will give the fruit an onion flavor. To keep the board from sliding put a flat damp cloth under it. 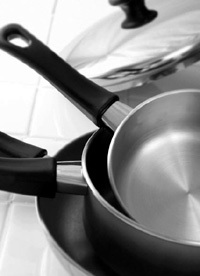 An introduction to the various types of pots and pans and what they are used for. Stock Pot - Large, high sided pots with loop handles for easy moving on and off stove; used for boiling and simmering as in the making of soups and stocks; can range from 5 to 40 gallon capacity/sometimes come with drain spout which is especially good for the production of consommes. Sauce Pot - Similar to a stock pot but the sides are lower to allow stirring of the ingredients; range in capacity from 2 to 15 gallons. Brazier (Rondeau) - Similiar to the above but of smaller capacity and much lower walls; heavy duty to resist warping when searing meats; this is a very useful pot to have in the kitchen for stove-top cooking; capacity ranges from 12 qts. to 30 qts. Saute Pan - One handled with sloping sides,shallow, usually used for quick frying of small amounts of food; size ranges from 5" to 14". Egg Pan - One of the smaller saute pans;preferred to be teflon coated for non sticking. Roasting Pan (Army Pan) - Rectangular pan with medium high sides; fold down handles for easy movement in or out of ovens; is also very good to use on the stove top; comes with removeable lid. Hotel Pan (full pan) - Also called food (transport) pan or chaffing dish insert,this pan comes in a variety of standardized sizes & depths; this pan is not used for cooking but for the heating & or holding of foods; this is the standard chaffing dish insert and steam table insert; one of the most used pans in the kitchen. Sauce Pan - Smaller version of the sauce pot; has a single handle; used the same as larger version but for smaller "on line" quantities; capacity from 1 qt. to 12 qts. Spoons - May be slotted, perforated or solid and are used accordingly. Ladels - May be slotted or solid/solid is most often used; comes in sizes ranging from .5 ozs. to 72 ozs. ; used for dishing up liquids/soups, sauces, etc., very important to use the proper size ladel for the type of function involved to control portions. Strainers (Colanders) - Used to drain items such as wash vegetables, cooked pastas, rice, etc; come in a variety of shapes/ with & without legs. China Cap - Cone shaped perforated strainer with long handle and hook; very strong usually used to strain sauces or first "pass" for stocks. Tongs - Come in many lengths/spring action "V" shaped for the handling of food without hand contact and used to handle and turn hot foods that are being sauteed or grilled. Pastry Bag - Usually made of cloth or nylon with a removeable tip; mainly used in the pastry shop, but, also used in hot and cold kitchens for "piping" mashed potatoes, purees, canapes and other forms of decorations; comes in a large variety of sizes. 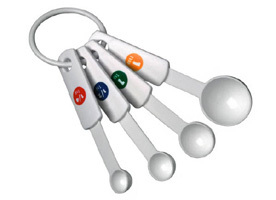 Whips - Flexible beater made of stainless steel; come in variety of sizes ( i.e. balloon whip) ; used to hand whip/beat items such as whipped cream or to work and stir sauces when thickening. 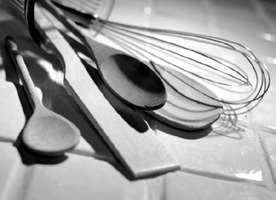 Whisks - Same as above, but stiff. Used for the same purpose as above but with heavier and thicker items that would not be workable with the lighter weight whip.